Austin Czerwiec was born with a severe hearing disability that was not discovered until he was three years old. He got a late start on basic sounds, vocabulary and reading, but once he was fitted with hearing aids he worked hard to catch up. The late start did not stop him from becoming a top athlete at Muscatine High School and an accomplished baseball player at Mount Mercy University, graduating in 2015 with a degree in business management and human resource management. 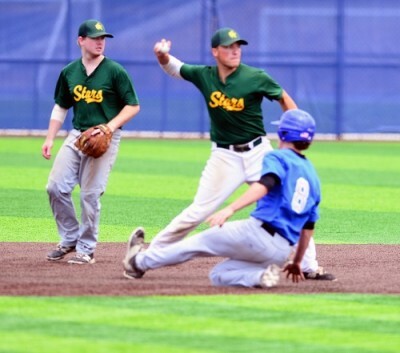 Czerwiec was honored as the Pitcher of the Year in the Iowa Valley League last season and he's excelling again for the Stars, the 2017 league and state champions. 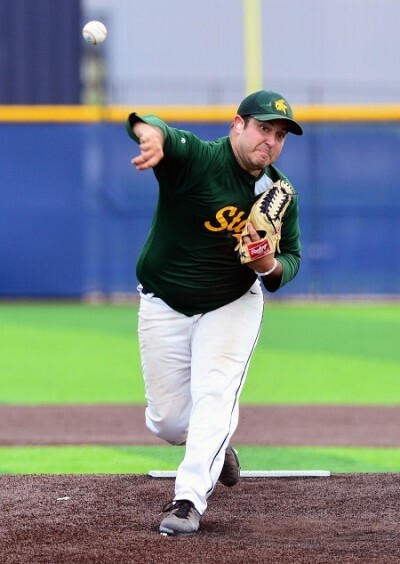 Czerwiec tossed another complete game Sunday as the Stars topped Walford, 6-2, in the first game of their doubleheader at Mount Mercy. The Stars won the second game, 5-1, to remain in first place with an 8-4 record. Czerwiec was born with what he called a bilateral hearing loss, with "severe to profound" deafness. He wears hearing aids in both ears and said he can hear only "about 40 percent" without the aids. "Since I was three years old I've had hearing aids," he said after Sunday's doubleheader. "I've worked with a number of interpreters and hearing assistants, and they've all helped me be able to hear and understand everything and work on my speech. They've done a lot for me." Czerwiec's parents, who attended Sunday's games, did not know their son had a hearing disability when he was a young child. In fact, they did not suspect anything was wrong. "My gramdma, she was watching me one day," Czerwiec related. "I wasn't responding to her and she told my mom, 'I think your son is deaf, you need to get him checked.' So they got me checked out and that's how they found out." His parents said babies were not checked at the hospital for deafness when he was born, although they are now. "It did not hold me back, but I definitely had to work harder growing up," he said. "I missed out on three years, because I didn't have hearing aids at the time. "I was three years behind growing up, basically, and I missed what all normal newborns hear. I didn't hear all that until I was three. "I had to work a little harder growing up, working to get my vocabulary up and doing more reading to understand words and everything." Czerwiec, 24, lives in Cedar Rapids with his older brother, Chad, and is employed as a production worker for Frontier Coop in Norway. He shows up every Sunday to pitch for the Stars, three years after finishing his college baseball career. "I love baseball," he said. "It's been my game since I was three years old, when I started with T-ball. "I watch the Cubs all the time when I can, I come play baseball on Sunday and I try to play baseball during the week on Wednesdays (in the area Night League)." Czerwiec compiled a 6-2 record and 3.22 ERA as a senior at Mount Mercy in 2015 and also hit .274 with two homers and 15 RBIs as a third baseman. He stays in shape by running and with cardio workouts and plays catch several times a week to strength his arm. Czerwiec gave up two runs on nine hits Sunday, with six strikeouts and no walks. John Thomas gave the Stars a 2-0 lead in the first inning with a two-run triple, but Caleb Sass tied the game for Walford with a two-run single in the second. The Hogs did not score against Czerwiec again. The Stars took a 3-2 lead in the bottom of the second on an RBI single by Cody Williams. They made it 5-2 in the third on an RBI single by Ben Larson and an RBI by Jacob Henry when he was hit by a pitch with the bases loaded. The Stars scored their final run in the sixth inning on a wild pitch. The Stars got more strong pitching from Blake Hargens and Blake Willenborg in their 5-1 victory in the second game. Hargens allowed only one run in five innings, then Willenborg tossed two scoreless innings in relief. Walford (5-7) took a 1-0 lead in the top of the fourth inning on an RBI single by Tyler Butz, but the Stars grabbed a 2-1 margin in the bottom of the fourth on a triple by Williams and RBI singles by Tyler Dralle and Eric Weisbrod. The Stars broke it open in the bottom of the sixth with three more runs, with Weisbrod and Henry collecting RBI base hits.